SEATTLE, Wash. – Aviation exists because of the value of face-to-face connection. 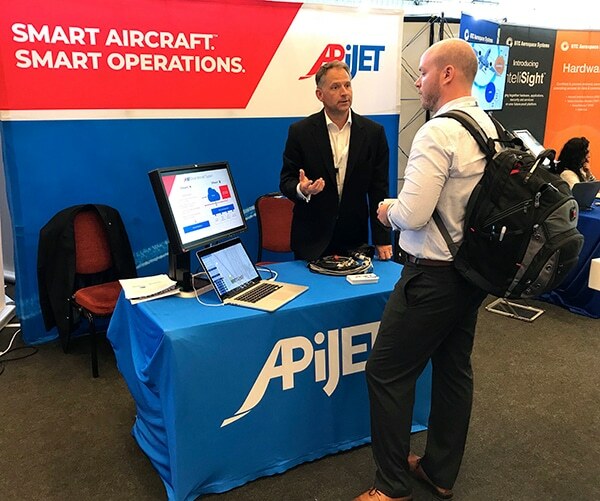 APiJET, the recently launched joint venture between Aviation Partners and iJet Technologies, experienced the power of in-person connection at its first tradeshow, the Aircraft Commerce MRO/Flight Ops IT Conference in Amsterdam, June 5-6. During the two-day conference, APiJET’s team met with eleven airlines. APiJET stood out as the only analytics provider working with real-time data and an open-architecture model. In addition to the airlines, attendees and exhibitors included other digital platforms that could use APiJET’s data service. APiJET’s open-architecture platform runs on a variety of server hardware, ingests data in multiple formats, and accesses any available IP communication link. The offboard data platform aggregates aircraft data, connects to ground-based applications and analytics via standard APIs, and integrates with corporate backend systems. This positions APiJET to respond quickly when customers present solutions ripe for integration. Conference attendees were especially interested in the idea of APiJET Actors™. These proprietary business-logic modules apply logic to know when and how to deliver data from the aircraft to applications that alert the right people as needed across operations: ground, flight, maintenance, administration and finance. Actors power APiJET’s Smart Aircraft™ solution. They create a configurable feedback loop between ground analytics and the aircraft. Data transforms into insight and is presented to the people who need it. This is done through APiJET or third-party applications. Airlines will have the opportunity to see the Actors working live at the upcoming International Air Transport Association (IATA) Aviation Data Symposium & AI Lab in Berlin, June 19-20.